Portland Farmers Market brings you face-to-face with 700,000 shoppers annually (both residents and visitors) who care about farm fresh food, health living, sustainability and supporting the local food economy. Frequently ranked in the top ten best farmers markets in the world, Portland Farmers Market offers our sponsors association with one of the most respected and well-loved organizations in Portland, working to support Oregon’s family farmers and food artisans while promoting healthy lifestyles for our community. 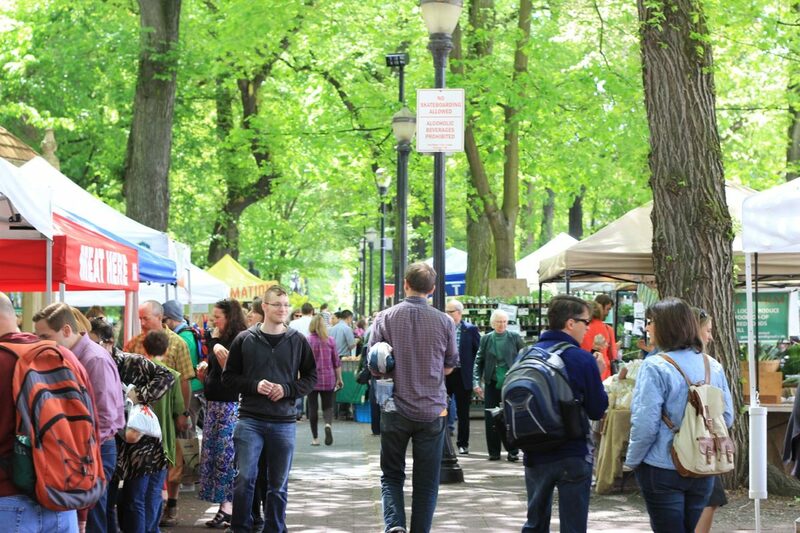 PFM operates five farmers markets, including our year-round flagship market at Portland State University on Saturdays. Through our annual advertising program, special events, and a robust digital media presence, we connect with thousands of shoppers every week… and you can, too! PFM’s staff and board of directors are dedicated to consumer education as a critical component of building sales for local agriculture. Vendors’ fees cover the basic cost of operating the markets, but in order to keep vendors’ fees as low as possible and still fund educational outreach, PFM relies on sponsors to support its programming goals, which include market events and programs, the Chef in the Market series, and the Kids Cook at the Market series. By becoming a sponsor of Portland Farmers Market, your organization shows a shared commitment to fostering a community that is economically, ecologically and socially sustainable. Launching a new product? Need to gather leads for a program? Want to host an interactive customer promotion? Without a doubt, one of the top foodie experiences in Portland includes a visit to the Portland Farmers Market, where local growers, cheese makers, bakers, flower growers, food artisans and craft beverage producers all come together to create a vibrant marketplace experience featuring the freshest of the Pacific Northwest. At our flagship market at Portland State University (PSU), guest exhibitors have the opportunity to connect with an average of 9,500 customers weekly, and as many as 16,000 on a peak summer day. We seek special exhibitors (one day only or limited engagement) that complement our vendor mix, enhance the overall shopper experience, and align with our market values. In exchange, we offer an unparalleled opportunity for face-to-face engagement, product sampling and lead generation for brands and businesses seeking to connect with our audience. Let’s discuss and see if we’re a good fit! If you are interested in learning more about sponsorship and special exhibitor opportunities with PFM, please contact Trudy Toliver, Executive Director at trudy@portlandfarmersmarket.org or call her at at 503-241-0032. Sponsor and exhibitor candidates are evaluated on an individual basis to ensure there is no direct conflict with PFM’s mission. Thank you to each of our sponsors for their generous support in helping us to achieve our educational and outreach goals—we couldn’t do it without you!